The new block tab feature gives you extra control over how your phone reacts to unwanted calls. Exciting upgrades just hit the screens of Truecaller Android lovers! We’ve now improved the service to keep you safer when it comes to unwanted disturbances. Our new block tab feature gives you extra control over how your phone reacts when you get an unwanted call, and it’s a much simpler way to reduce inbound spam. Scam calls have made U.S. headlines in the past due to scams like the ‘One Ring Scam,’ where many calls originate from an area code outside the U.S. Truecaller is able to help in these harmful situations by blocking whole area codes from contacting you, and preventing you from becoming a victim. Call Centers all over the world are also notorious for cold calling from multiple numbers. This can be avoided if you are able to see a pattern in the number that is constantly harassing you. 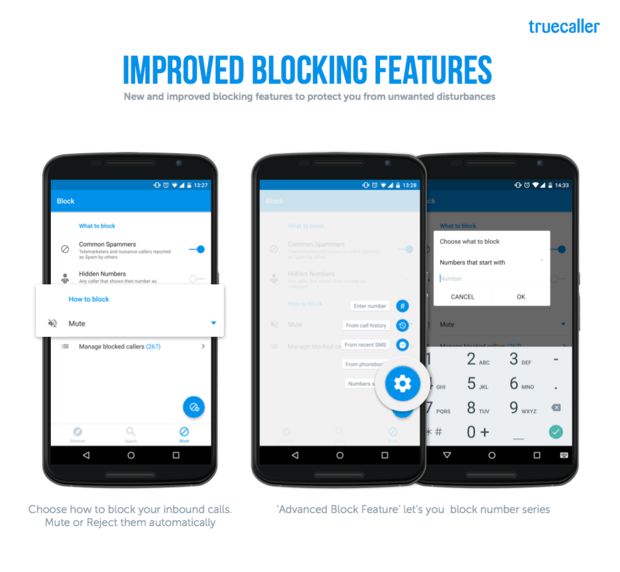 Simply use Truecaller’s advanced blocking system to add the number pattern to the blocked list. •	The new advanced ‘Block Feature’ packs a powerful punch when personalizing how to be contacted. Want to block a whole country from calling you? Easy. How about a number from certain area code, or one that contains a certain series of numbers? Done! •	Set your preferences to block calls, either using Hang Up, which rejects them automatically, or you can set them to Mute, which lets them ring silently. Our Truecaller users are over 100 million strong, which is a lot of manpower for reporting spammers from all around the world. As an active member of the Truecaller Community, you are able to help each other avoid unwanted calls, and share information quickly that could help someone across the world avoid being targeted as the next victim of a spam, fraud or harassment call. What’s even more convenient is the list is updated every day to keep you protected.